In Lexington’s Cheapside Park, it isn’t uncommon to see people enjoying lunch at one of the cafes or restaurants that line the street, or lounging around on outdoor patios. In the evenings locals walk their dogs on the lawn of the old courthouse, and on summer nights, bands play on the Pavilion stage; on Saturdays, the street is alive with the local farmers market. It is a more modern version of the marketplace in this same place in the 1800s and early 1900s. The courthouse that stands next to Cheapside Park — that is no longer a working courthouse, but now a museum and office space —is the fourth on that site. 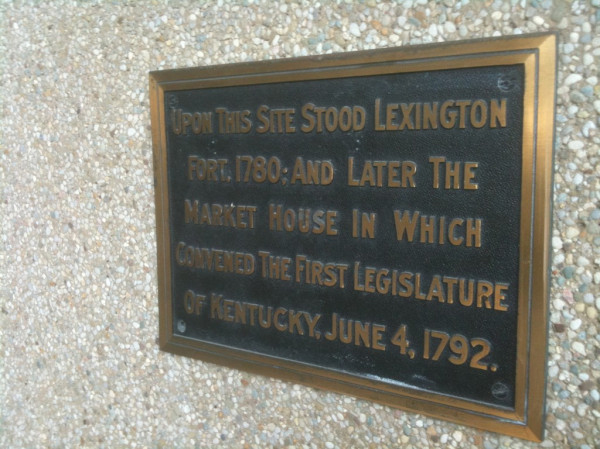 The first was built in 1788; Lexington had one courthouse before the construction of the first on this block. The current Lexington Circuit and District courts are located a few blocks to the east of this site. The intersection where the settling of Lexington began. (And no, that orange construction barrel isn’t the marker). The 5/3 Bank building — or “Big Blue Building” as we wise locals call it — stands in stark contrast to how the block looked less than a century ago. The second photo was taken in April 1920. Sometimes when Cameron and I set out on a road trip, we have a particular plan or goal in mind. That’s not to say that we actually stick to this plan, but we know where we are headed and what we want to see. This time around, we truly had no plan at all. So we just wandered. When we met up in Lexington a few weeks ago, we left our cars parked along a curb downtown (expertly parallel parked, I might add — thanks for those driving lessons, Dad) and set out on foot. We walked through Transylvania University’s campus to Gratz Park and then continued down Limestone to Cheapside Park and Main Street. It was one of those unbearably hot days of late summer — the air was so thick with heat that not even the coolest afternoon breezes brought any relief. But as we wandered along, stopping at all of those historical markers and learning a little more about the history of the town we grew up in, we stopped caring so much about that St. Bernard that seemed to be blowing hot puffs of breath in our faces, and we thought more about the origins of Kentucky’s second-largest city. Not everything can be learned in one afternoon. And there are many, many things to do in Lexington that involve air conditioning and entertainment far better than Cameron’s lame banter (sorry, Cam). But if you haven’t done it before — and my guess is many of you haven’t — I’d invite you to get out and walk around the historic areas of Lexington … or of your own hometown. It’s amazing the things you might learn. • If you’re going to take a walking tour of Lexington, it’s best to do a little research ahead of time. There are many resources on the Internet that can help you find starting places for your self-guided tour as well as key points you won’t want to pass up. For Lexington, we recommend the Convention and Visitors Bureau Bicycle Tour of Historic Lexington. You don’t actually have to have a bike … we walked it. 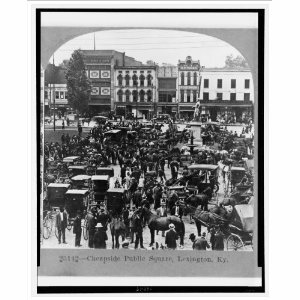 Also check out this Historic Downtown Walking Tour website for more information. If you are specifically interested in the African American Heritage Tour, check out this website. • As always, make sure you have your camera. • If you have a friend who has random trivia or historical knowledge (like Cameron does) take them along, it will provide information and entertainment along your journey. • Take a water bottle — especially if you’re touring on one of those lovely late summer afternoons. • Talk to the locals. We met a delightfully friendly and fun man who lived along one of downtown’s streets. He was walking his dog Winston Churchill and he had lots to tell us about Lexington. • Read those historical markers. They were put there for a reason … they’re often filled with historical information. • You’re not in a history class, it’s supposed to be fun. So make it fun! No one says learning has to be boring! (Now I’m REALLY starting to sound like Cameron). Not a dang thing. We had an afternoon of fun, laughter and learning for FREE. Well, unless you include the couple bottles of water we took with us. Oh, and the taco ingredients we bought after our journey … we worked up quite an appetite. And if you’re looking for other fun and free things to do in Lexington, check out this list from the Convention and Visitors Bureau. For more of our photos of downtown Lexington, check out My Old Kentucky Road Trip’s Flickr page. Thanks for the shoutout! You all are awesome!